It’s sheep’s milk ricotta season and Edward has been buying it ever since Easter at Tino’s, though I often find it year round at Buonitalia in the Chelsea Market. He made a couple of dishes with it this week: baked pasta with marinara and ricotta, and stuffed chicken legs. 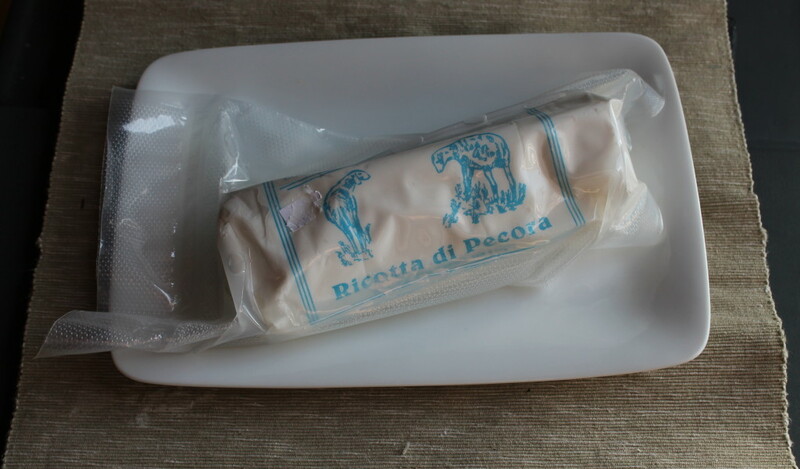 We often use ricotta salata made from sheep’s milk: as a garnish on pasta, or even as an eating cheese. At Easter we ate a traditional Napolitano Easter dish of soprassata, halved hard-boiled eggs, and ricotta salata. The guys at Randazzo’s gave Edward a huge Swordfish backbone that Edward gleefully brought home and made into a fish stock by simmering the backbone with carrots, celery, and onion. 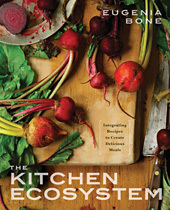 He strained the stock and picked the meat off the bone. He made a salad with warm potatoes, avocado, sliced raw onions, and parsley with the bits of meat he got off the bone, and a soup with the stock: first he sautéed onions, garlic, and celery, and then added tomatoes and white wine and simmered for about 10 minutes. He pureed this sauce and added it to the fish stock. One day he served the soup with rice and peas, another day with bird’s nest pasta and grated cheese. Three meals, and he didn’t have to pay for the fish. Edward’s tender feral broccoli rabe is coming up and he has been eating it regularly, sautéed with garlic and hot pepper and mixed with boiled penne one day, with boiled potatoes, garnished with good olive oil the second day, mixed with cranberry beans that had been boiled until tender in chicken stock a third day, and finally (sheesh) sautéed feral rabe combined with beet and potato salad. The beets and potatoes are boiled separately (otherwise the beets stain the potatoes pink), then peeled, sliced and gently tossed with olive oil and salt and pepper. In a large bowl, combine the ricotta, egg yolk, parsley, cheese, and salt and pepper to taste. 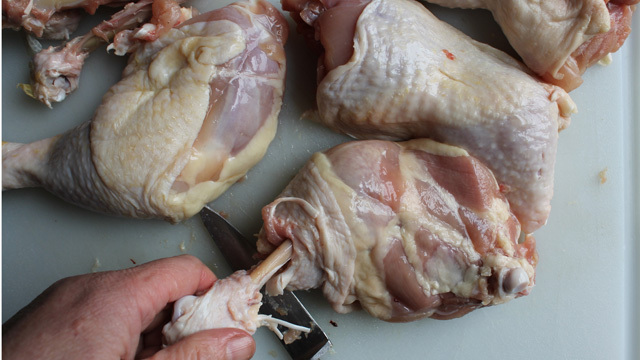 Lay the chicken legs on your counter skin side down. Spoon about 1 tablespoons ricotta into the leg cavity, and another into the thigh cavity. Pull the skin over the thigh. Season the meat to taste. 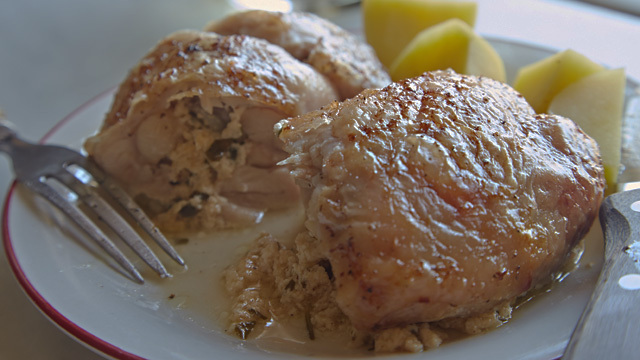 Place 2 tablespoons of oil in the bottom of a roasting pan that will hold the chicken legs snugly. Place the chicken seam side down into the pan. Season the chicken. Add the white wine and rosemary. Place the chicken, uncovered, into the oven and cook for 40 minutes, until the chicken is golden brown and the stuffing has set. 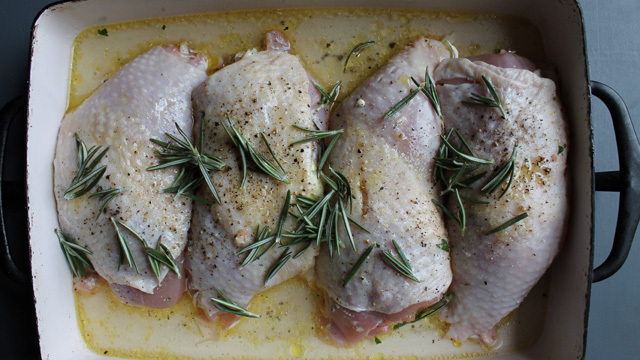 Remove and allow the chicken to rest for 5 minutes before serving. 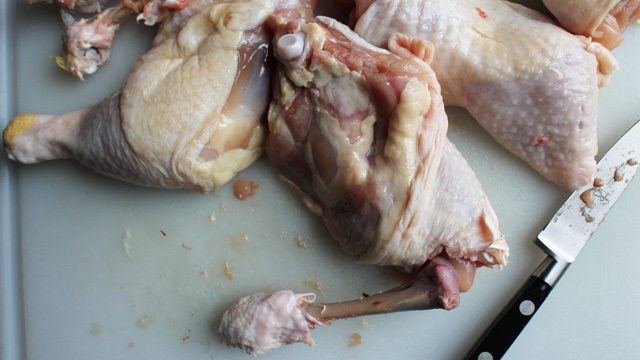 Note: To bone a chicken, cut around the ankle. With a small paring knife, scrape up the leg bone pushing the meat up the bone as far as you can. You will need to cut a few tendons. 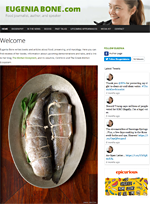 Don’t worry about removing them: they disintegrate during cooking. Twist the leg bone loose and discard (or save for stock—the bones from boning these four legs makes about 1 pint of stock). 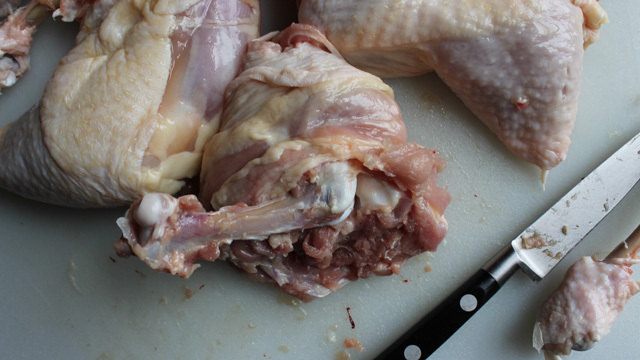 Remove the thighbone by gently pushing the meat toward the joint. You won’t need to scrape it: this meat pulls away easily. 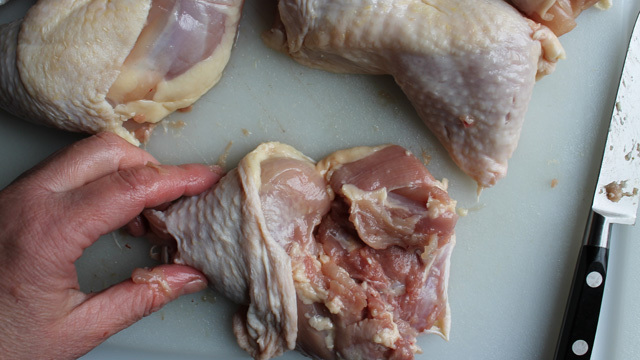 Cut the thighbone free of the knuckle, and then cut away the knuckle itself. Don’t worry if your first leg looks kind of messy. By the third you will be a pro!